David Wolkowsky at Ballast Key in 1994. Photo by Timothy Greenfield-Sanders for L’Uomo Vogue. Key West lost one of its defining figures with the death of David Wolkowsky on Sunday, September 23, 2018. He was 99. Wolkowsky was a member of the Key West Literary Seminar board of directors from 1988-1991 and a member of its honorary board since 1992. But his impact on Key West and its literary and cultural scene was far greater than these official contributions. Among other things, Wolkowsky was a legendary host and matchmaker without peer, who brought an astonishing assortment of writers, artists, and “interesting people” together in the subtropical island city where his grandfather had arrived as a penniless immigrant following Key West’s great fire of 1886. Wolkowsky’s annual writers’ party, held during the seminar each January, was a glittering affair at the penthouse apartment Wolkowsky built atop his father’s former Duval Street department store. A guest list of renowned writers mixed with celebrated artists, filmmakers, politicians, and A-listers from around the world, along with the local bartenders, tradespeople, fishermen, and friends for whom it was the most coveted social occasion of the year. Even more coveted was an invitation to Ballast Key, Wolkowsky’s private island, where he hosted friends in the heart of the 200,000-acre marine wilderness known as the Key West National Wildlife Refuge, far from the bustle and noise of the downtown district whose once-dusty streets he had known since childhood in the 1920s. 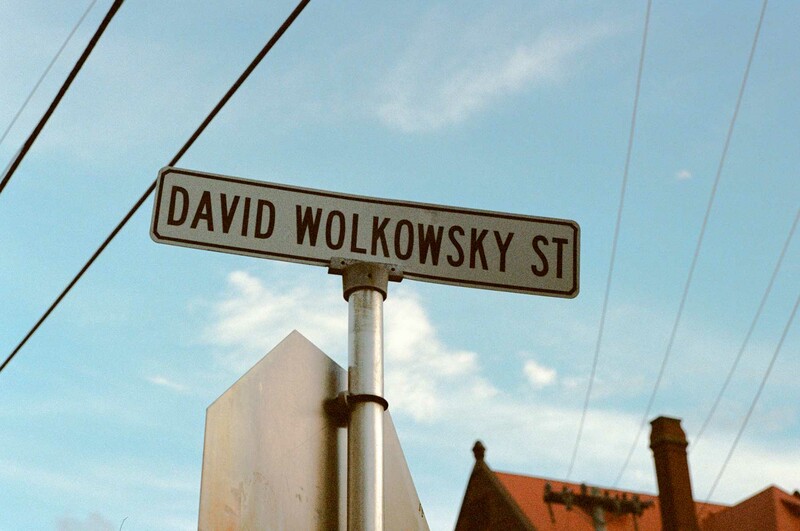 I was lucky to know Wolkowsky and count him as a friend throughout my adult life. From the moment I met him, in the winter of 2001-02, I was charmed by his unique combination of refined elegance and deep informality. 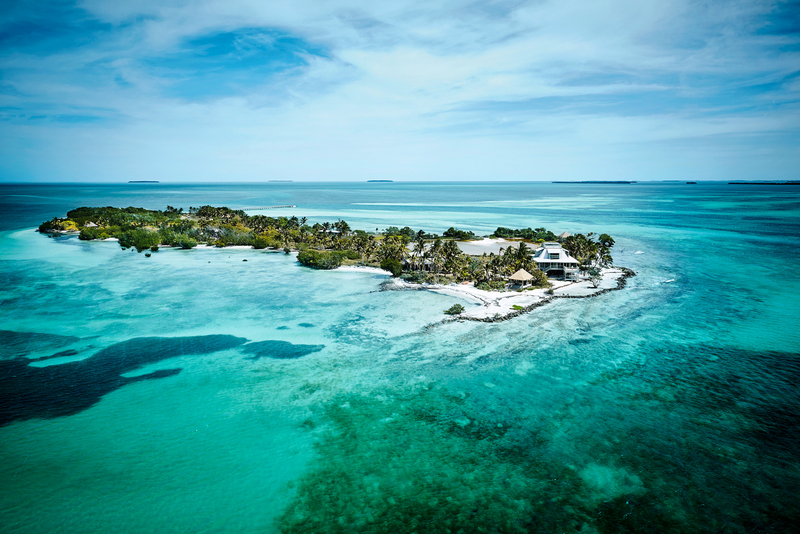 I had returned to the Florida Keys that December after graduating from college and was drifting about, with vague ambitions of being a writer and an even vaguer idea of how to earn a living. My mom, who had known Wolkowsky from her time as director of the Seminar, suggested I call him and ask if he was looking for any help. I looked him up in the phone book and placed a call. “Hello, Mr. Wolkowsky?,” I said, nervously. “Call me David,” he said, deeply familiar and kind before even knowing who I was. “Who is this?” he asked, brusquely now. I offered a brief recent history: graduated college, home again, looking for work. I told him my mom had said he might be looking for someone. I called him David ever after. David's father and grandather, Isaac and Abraham Wolkowsky, ran a men's clothing store around the turn of the century. It appears at right in Mario Sanchez's "Old Island Days No. 23, 'Golden Era,'" shown here at David's home. Photo by Michael Adno. Arriving for lunch that Friday, I entered the property through an ornate set of teak doors, removed from a Thai temple during the early 1980s, when David had been a partner in Kavanaugh’s furniture store, whose dusty storerooms full of strange, large, and wonderful eastern relics, I used to love to wander. Directly through these doors, which were set in the concrete block wall that hid his grounds from the passing public, was a swimming pool the size of which I’d only seen in hotels. On the left of the pool was a grand-seeming house, whose interior could partly be seen through the wall of sliding glass doors that fronted the pool. No one answered when I knocked and called out, but the front door was standing open so I walked in. A single large room, with two sides of sliding glass and a high, vaulted ceiling, from which slowly whirring fans descended. The fans hanging through such volumes of space drew your eyes up, as in a cathedral, to the little windowed cupola that formed the apex of the room, where every surface seemed to overflow with fascinating items. On top of the grand piano were black-and-white photographs of Tennessee Williams, drinking and laughing in a Key West garden along with some glamorous-looking women and other men. Upon the table, a mound of reading material: the New York Times lay open, rifled through and obviously well-read, and dozens of books ranging from large-format coffee-table art books to biographies of historical figures. A striking wooden sculpture by the local artist Duke Rood—the vertical figure of a man descending headfirst—was situated among flowering orchids on a table at the center of the room, giving the impression that he he was diving, or had fallen, from a perch in that airy cupola. A drawing, signed “Picasso,” was on the back wall, near the porch, obviously neglected. There were a few Russian-constructivist-ish collages, and, scattered about, several of the colorful painted wood reliefs created by Mario Sanchez, a folk artist of rare talent and humor who had chronicled the Key West of David’s boyhood. I found David in the middle of all this, sitting and talking on a white couch with his friend Tom Schmidt, who owned one of David’s favorite restaurants, the Rooftop Café. The three of us exchanged pleasantries and I noticed another man standing in the entryway to the kitchen, who seemed to be a little older than I was. He was dressed in white tennis shorts and a polo shirt, with white tennis shoes, white gardening gloves, and sunglasses, and he stood quietly in place, with his head and its artfully disheveled afro pitched slightly down. “Arlo, this is Zach,” Zach raised his head and smiled beatifically, showing a mouthful of crooked teeth, two plated in gold. “He helps out here,” David said. “Hello,” Zach said, and he seemed to float away on the word, smiling at some memory, of what I didn’t know. “Perhaps you could give Zach a hand in the kitchen,” David suggested. I followed David into the kitchen and watched as he opened the refrigerator. Zach remained in his original position. “Sure, David. No problem.” As David left the kitchen, I saw my lunch invitation transform into an audition for a job I wasn’t sure I wanted. “Zach, where are the plates?” I asked. “In the cabinet,” he said, indicating the corner, and smiled again, without moving from the spot where I’d first seen him. I prepared, quickly and artfully, in the fashion of the restaurant line cook I had been off-and-on through college, three simple salad plates, drizzled with olive oil, topped with ground pepper, and garnished with a lemon slice. David stepped back into the kitchen at this moment. It was a test, I suppose, and everything seemed like a test for a while, but eventually I guess I passed, as that shift in the kitchen marked the beginning of my employment as David’s roaming man Friday and caretaker of his various properties. Ballast Key, roughly nine miles west of Key West in the Key West Wildlife Refuge. During the year I worked for David, my duties tracked his interests and eccentricities, mapping a social tableau that spanned from high to low. At night, I was his driver, delivering dinner guests that included U.S. Senator Daniel Patrick Moynihan and John Hersey’s widow Barbara Hersey, to whom David was deeply devoted, to and from dinner at the Rooftop Café. In the early morning, I accompanied him to Simonton Beach, where a group of homeless men slept in the shadows of the Pier House, the fashionable resort David had developed in the 1960s. At that first lunch with David, I had told him about my experience as a stonemason in upstate New York, and without exactly telling me, David had decided that I would build a stone retaining wall at Ballast Key, where storms and shifting tides had eaten away at the beach where his dear departed friend John Malcolm Brinnin had once sat and read the New York Times while the Gulf of Mexico lapped at his feet. There was plenty of limestone surrounding the island, David pointed out to me on my first visit there, and indeed there was. The fact that it was underwater at all but the lowest tide, and would require a great deal of hard labor to extract, went unmentioned. David’s methods were inscrutable, but somehow, among the tall grasses of the sea oats and empty vodka bottles at Simonton Beach, offering $5 an hour plus room and board on his private island, he always found one or two men who said they were willing to put in a few good days’ work. In the afternoon, I ferried men whose names were Miles and Popeye, and whose weathered skin and full beards made them look older than they were, aboard the smaller of David’s two boats, which pitched and rolled uncomfortably in the current-driven chop of Northwest Channel, out to Ballast Key, where we established a work camp. Against the incoming tide and in the blazing sun, they worked with heavy iron bars to break jagged slabs of limestone from the shallow waters that surrounded the island and carry them in overloaded wheelbarrows to the beach where I was building the wall, piece by piece. Lunch was hot dogs and potato chips, the same again for dinner. Who knows what the men thought after the sun went down and they found themselves alone on this otherwise deserted island—a millionaire’s paradise and private retreat, or something wild and forbidding? Ballast Key always seemed a bit of both, and while Miles and Popeye returned for multiple engagements, it wasn’t for everyone. One morning, I found Rudy, a gentle, bearded man who lived as a hermit in the Maine woods in the summer, and in the Key West cemetery in the winter, desperate to “escape,” as he put it, holding a cardboard sign that read “Key West, Please!” as he waved frantically at passing boats. “I can’t take it anymore,” he told me, obviously shaken. I told him that everything would be ok, he was under no obligation to stay, and I took him back to Key West. I would see Rudy around town occasionally in the years that followed. Although the island’s black and glittering night had terrified him, he apparently remained charmed by the man who had brought him there. “How’s David?” he would ask me, and you could tell that part of him wished he could return to the island. On the weekends, as my retaining wall slowly came together, I began ferrying more illustrious guests to Ballast Key, a Vanderbilt here, a Rockefeller there, and the ever-growing cast of dazzling writers among whom David always seemed most at home. Driving the 27’ Boston Whaler that David reserved for guests, I delivered Robert Stone to the island one evening as darkness fell, leaving him there, alone, to work on completing the manuscript that became the novel Bay of Souls. While navigating the shallow expanse of water known as “the lakes” that separates Northwest Channel from Ballast Key, I was introduced to Laurent de Brunhoff, co-creator of the Babar series of storybooks I had known as a child, and his brilliant wife, the writer Phyllis Rose, who would later help edit my first book. I met famed writer Judy Blume and her husband George Cooper, another couple David recruited to Key West and who in turn created its only independent cinema and its leading bookstore. I talked with Renata Adler, whose thick braid of white hair swayed in the heavy wind generated by the boat’s forward motion. I met Bill Wright, a writer whose charm at times rivaled David’s and whose friendship with him then spanned nearly forty years. So many people whose names and backgrounds dazzled me, either immediately or only when I eventually realized who they were, years later—guests from London, New York, South Africa, Paris, Rome. An endless, rotating cast of fascinating writers, shouting literary references and friendly gossip over the roar of the twin outboard motors, with David occupying the co-captain’s chair and smiling on at the scene he had designed and casted. At the island, David served them hot dogs and potato chips for lunch too. David with his friend Sarah Benson, during a 2012 party at his penthouse above Duval Street. Photo by Nick Doll. David loved people and conversation and he had a gift for making his friends feel wanted. When David phoned to invite you over for lunch, there was often no need to check your schedule. He meant lunch today, and that you should arrive within the next fifteen minutes if possible. When I could, I dropped everything to join him. When I had something that seemed more pressing, I declined and regretted missing the opportunity. I regret those missed opportunities still. Once, in September of 2008, David phoned to invite me over as Key West was being lashed by the winds and rain of Hurricane Ike, which was churning along the southern coast of Cuba. A mandatory evacuation order was in effect, but when I arrived I found the house on Flagler un-boarded, and David the picture of ease, chatting leisurely on the phone with Bill Wright, who, since our first meeting at Ballast Key years earlier, had also taken me under his wing, surely with David’s encouragement. I followed David into the kitchen, where he removed two salads from the refrigerator that had been prepared earlier—Boston lettuce and Florida avocados, seasoned with olive oil, salt, and pepper. After we ate the salads, David prepared lamb chops on a George Foreman grill—they charred and filled the air with rich aroma as succulent juices sizzled on the electric heating element. David cooked them to perfection on the unlikely surface, utterly delicious. For dessert, David warmed two slices of pumpkin pie in the oven and served them with vanilla ice cream. After lunch, David said he wanted to see the island—not “the island,” as he always called Ballast Key, but the one whose ascendant place in the national consciousness had led to his popular nickname in the press, “Mr. Key West.” We climbed into the car as the rain drove down and David, who had just turned 90, got behind the wheel. He drove to a house he was renovating on Von Phister Street, where we took advantage of a brief break in the rain to have a look inside. The new roof and windows were holding up nicely in the storm; there were no leaks and it was utterly quiet inside, without even the hum of electricity. Ike was his father’s name and I think the hurricane had made David nostalgic—for the man whose death had brought him back to Key West over a half-century ago (a 1962 obituary said Ike had “a strong sense for the absurd or ridiculous”), and for a Key West that he felt, at times, was changing from authentic to commodity. After surveying the rising waters on Eaton Street, David drove me back to my house on Love Lane. 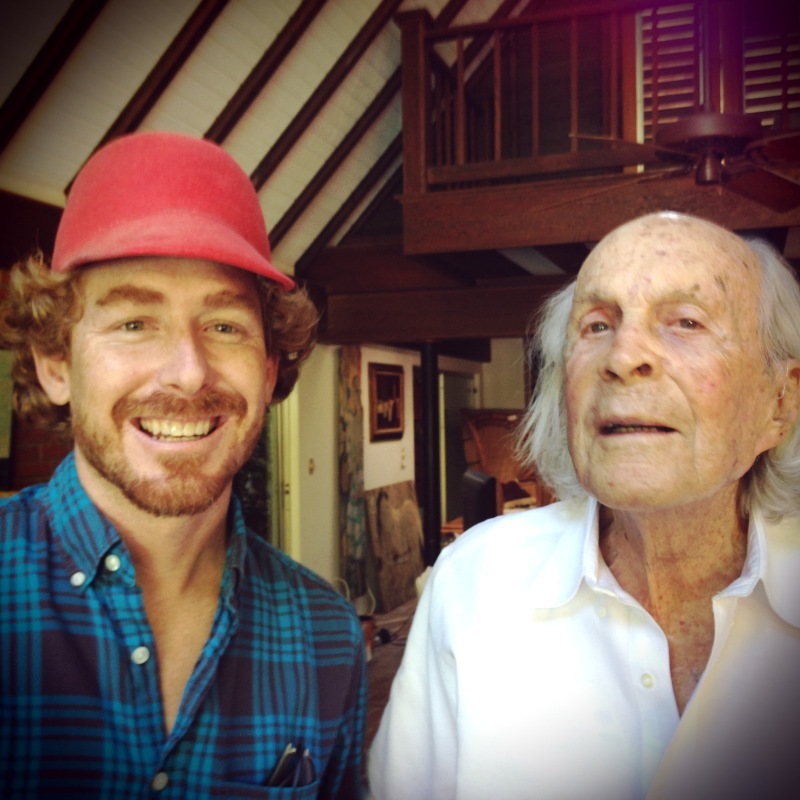 I’d been fascinated by the twists and turns of our conversation, and all the bits of Key West history he had revealed, and I asked if I could do a formal interview with him at some point. As the years went by, David’s oldest friends seemed to pass away one by one. 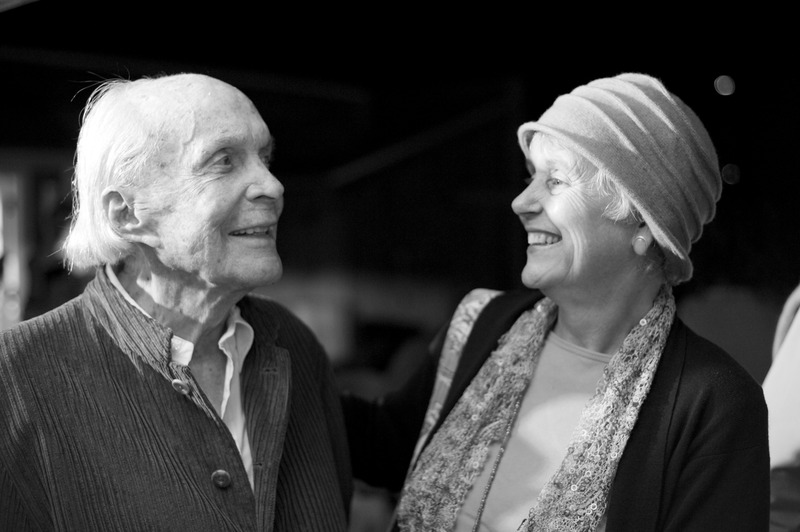 Some time after Bill Wright died in 2016, David told me that he had never expected to live so long. It was lonely, at times. I could see that. Arriving at a friend’s party, filled with people, he joined me on a couch at the edge of the crowd and surveyed the room. “Who are these people?” he asked. But of course everyone knew who he was, and soon his many admirers were crowding around, patiently waiting their turn to share time—that ineffably precious resource—with David. David introduced me to and made me welcome in the fascinating world that was his. He opened doors that have helped define my life and career. Through it all, he kept me laughing with his inimitable sense of humor, by turns cryptic, campy, wry, self-effacing, and bold. Over the past two years, with David occasionally having difficulty talking, a flurry of handwritten notes came in place of the usual phone calls. On my 38th birthday, a postcard from Ballast Key, showing a small boat at rest on a pile of jagged limestone—“I still remember the Ballast Key stone wall of Arlo”—a teasing joke, since Hurricane Ike had largely destroyed the wall I built and shifted John Malcolm’s beach yet again. Another postcard arrived soon after I took over the directorship of the Seminar, one that showed David at the beginning of the construction of the Pier House, standing in shorts and a t-shirt with the old Tony’s Fish Market hoisted high on blocks—“Arlo, it’s so great to have you where you belong. So hello, Dolly.” David even started emailing, surely one of the very few times someone opened a Gmail account at the age of 96. A stream of jokes and references followed from his iPad. There was a YouTube clip of Marlene Dietrich in concert, a selfie of David with someone’s dog in the driver’s seat of his vintage Excalibur (this to congratulate me for a talk I had given, saying “you don’t need a pup to charm an audience”), a simple photo of flowers on a table in that cathedral-like living room of his, and another selfie with his old friend, Mickey Wolfson, whose illustrious family history in Key West tracked David’s to the 1880s. “Wolf wolf,” he typed, and I could almost hear him laughing. David and I at a yard sale in 2013 — he ended up with the hat. Photo by Ashley Kamen. Key West will go on, and David’s vision for it will continue to inspire me to work toward a more interesting island. But there will never be enough David here again. I will miss him a great deal. One more memory. When Ashley and I were planning for our wedding in the spring of 2012, we knew exactly where we wanted to throw the party. There are a lot of beautiful old homes and gardens and venues in Key West, but there was only one place that, when you were there, you reliably felt that you didn’t want to be anywhere else, and you didn’t want the night to ever end. “But it’s David’s penthouse,” I said. I couldn’t imagine that our party could happen in a place that was so thoroughly David. And I couldn’t imagine asking him for something so personal. During the year I worked for David, there was an expression, a single word, actually, that he would deploy if you asked a question that was too personal, or if you said something within the hearing of someone who shouldn’t hear what you were saying. I was sure that asking David if we could throw a party at the penthouse was a seven. But Ashley convinced me, and I picked up the phone. “O.K.” he said, and paused. “I wouldn’t,” David replied sharply. I knew it. It was too personal, too private a thing to ask. I felt my cheeks flush as I struggled to think of how to continue the conversation. 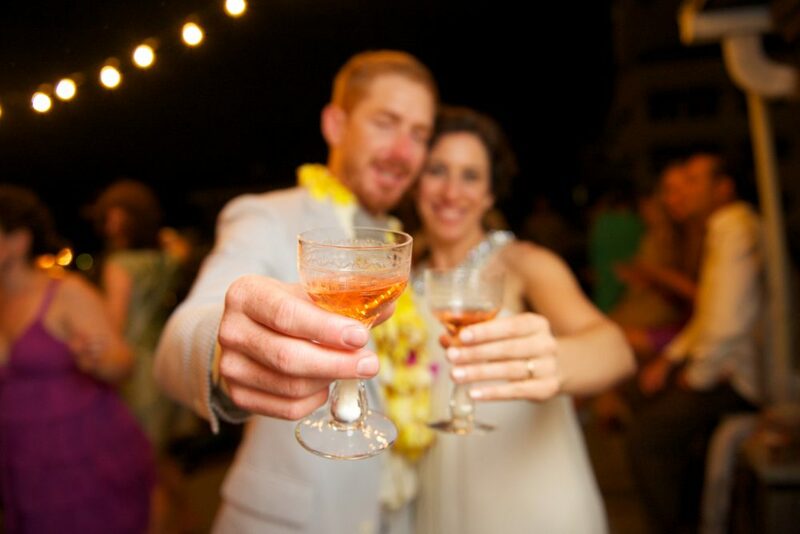 A toast to David on our wedding night, 2012. Photo by Nick Doll. Friends and relatives from around the country flew in to join us and dozens of local friends “on the roof” at David’s penthouse. It rained all day, but the clouds broke before the ceremony to reveal a dazzling sunset. As we arrived at the party, stars were visible above the glow of Duval Street. 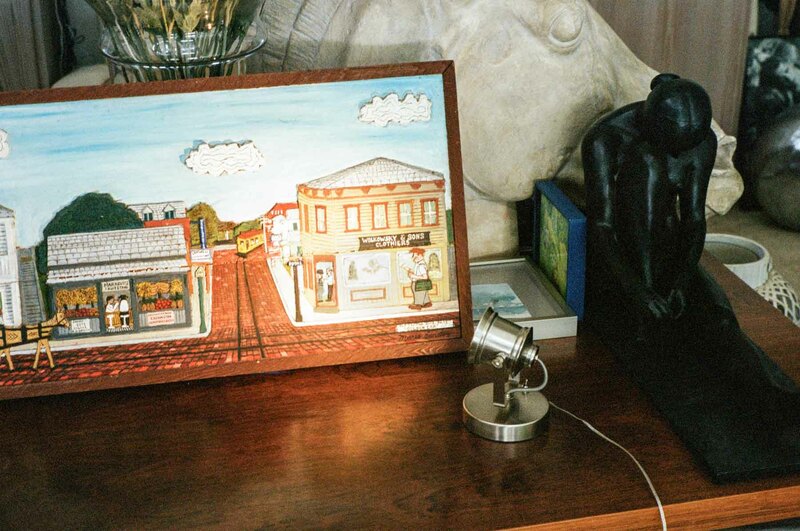 David stayed home at Flagler Avenue that night, but his gift was all around us. Out-of-town guests were in awe—this is Key West? Where are we? Key West friends felt the same. They’d only ever heard of this place, and now they knew why. The handful of mutual friends of David’s and ours that attended, including a number of the writers I’d first met on the boat rides to Ballast Key, seemed impressed and proud. They had known me when. Now here I was with Ashley on our wedding night, a night that only David could have made possible, filled with the glamour that only David possessed. Arlo Haskell is executive director of the Key West Literary Seminar and author of The Jews of Key West: Smugglers, Cigar Makers, and Revolutionaries (1823-1969). Obituaries in the Washington Post, the Miami Herald, and the New York Times. 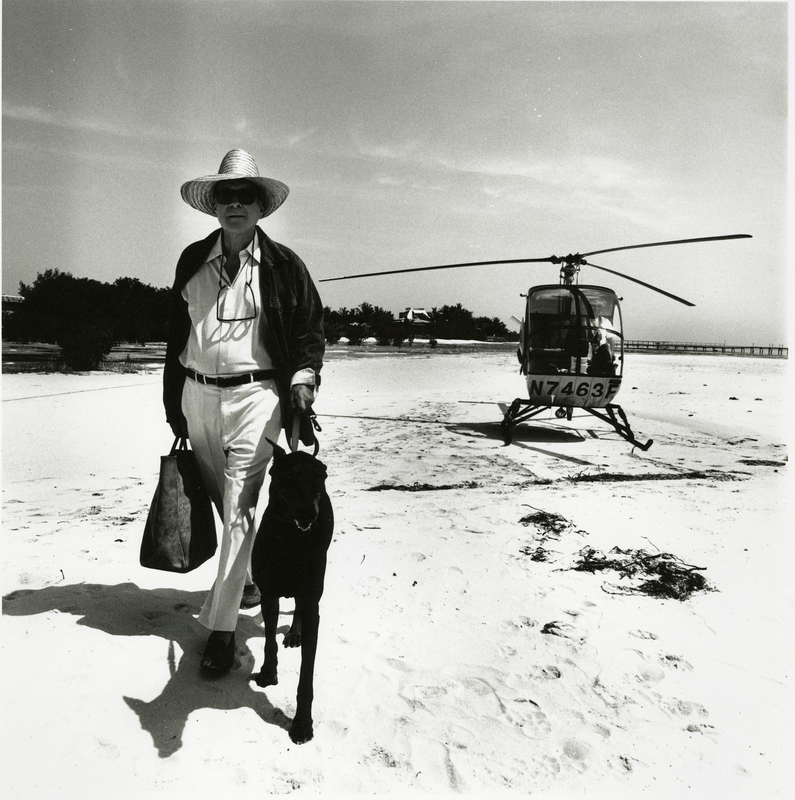 “Remembering David Wolkowsky and the Glamour of Key West” — Nan Klingener, WLRN Radio. This entry was posted in Key West’s Life of Letters. Bookmark the permalink. Again, Arlo, great memorial. You were indeed very fortunate. Wish I could have made that wedding!